Retailers are right to feel anxious about this growing technology. From surveys, analysis and commentary, here’s what they need to know. No shortage exists of statistics that indicate the speed and extent to which retail consumers are absorbing wireless mobility into their shopping habits and brand interactions. The smartphone and the tablet have become simultaneously a concierge for shoppers and an ambassador for brands. 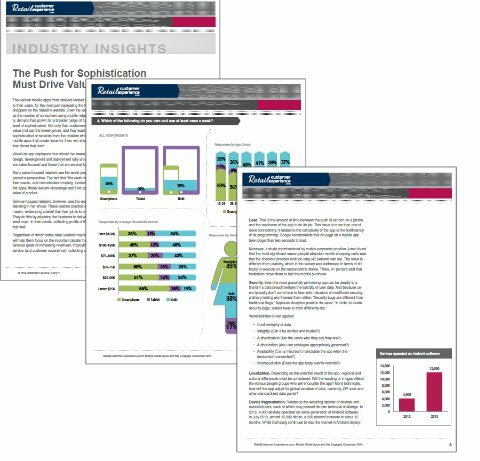 In addition to data provided by consumers, this 59-page report includes a section on the core components of retail mobile application success, insights from industry experts and a directory of providers. You’ll also get jpgs of all charts and graphs, breaking down consumer input based on age group, gender and average household income. Stay informed about your industry and what consumers want from a mobile retail application. Purchase and download your copy today!